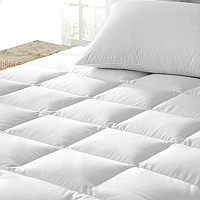 Downright Mattress Pad White Goose Down - Swatches may be available. Indulge in the luxury of a down filled mattress topper. 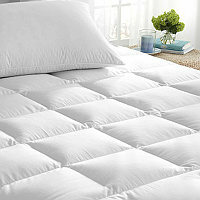 It is one of the easiest ways to add an extra layer of softness to your bed. Fluffy and comfortable, our down mattress topper will add, comfort, plush support and protection to your mattress. Mattress pad features box design to prevent fill from shifting and fully elasticized spandex skirt for a customized fit.